Growing up, I always liked Elvis, and I remember being sad when the radio DJ told us that he had died. 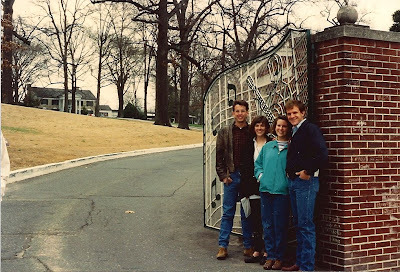 Still, I had never quite experienced all-out Elvis Love until my visit to Graceland in 1991. Some college friends and I drove to Memphis over spring break, listening to a mix tape (1991, after all) of every song about Elvis you could ever imagine. Then we'd listen to Elvis himself, hit after hit after hit. By the time we wandered into our first gift shop on Elvis Presley Boulevard, where even more Elvis music was piped in, we were oh-so-close to Elvis overload. ...even if he didn't look all that much like the real Elvis!